One of the most famous and delicious Egyptian desserts dates back to the rule of Shagarat el-Dour. She invented this sweet to celebrate her taking over her husband (sultan of Egypt). Umm Ali in Arabic means "Ali's mother", she was the first wife of the sultan of Egypt Ezz al-Din Aybak who became sultan after he got married to Sultana Shajar Al-Durr. When the sultan was killed, his wife Shagarat el–Dur offered people a desert made of Egyptian Bread (Roqaq) soaked in milk with sugar and nuts. Since that time, the dessert was named after her "Umm Ali". Now the desert is usually prepared from Egyptian flat thin bread soaked in whole milk with sugar and nuts and then baked in an oven for a while. The easiest and most delicious way to cook Umm Ali is to use a ready-made mille-feuille (can be purchased in any supermarket in Egypt) and top it with sour or sweet cream. It’s easy to buy the desert in any shop of sweets or dairy shops. In Sharm el Sheikh many restaurants offer the desert after the main course. 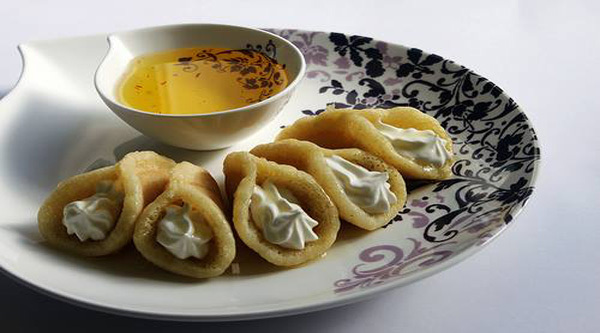 It is Arabic pancakes, usually filled with cream or nuts and served with a sugary syrup or honey. 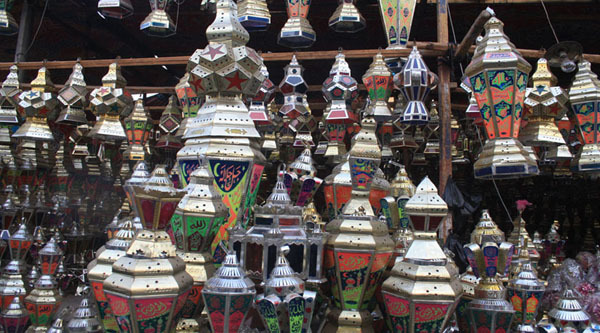 It is originally famous in Egypt and can be found everywhere in the streets as a rule during Ramadan time only. Especially interesting to watch local guys preparing Qatayef for sailing in the streets before breakfast time, so you do not need to bother yourself with it, just buy half-ready pancakes and fill it in at home with anything you like. It is really easy to cook and so delicious to eat. Unfortunately it is difficult to find Qatayef in Egypt in other time rather than Ramadan, but you can always cook it yourself as it is easy, just make small pancakes half fried (from one side only), then make a con from it and fry from all sides until ready. When it is a little bit cold, put it in syrup for some minutes and fill it with anything you like, here it is, your Egyptian Qatayef ! Where to buy : In Cairo you will find half-ready Qatayef in the streets near most small ovens. People will cook it in front of you before the breakfast time during Ramadan only, so you will have to come early to get your turn and buy it. Usually it will not be ready Qatayef , just small pan-cakes which you have to fill in yourself. Most famous shops like Twinky will sell really Qatayef with different fillings. Another traditional Ramadan sweet or cookies which are so rare to be found in shops of sweets after Ramadan time. You will not believe but it dates back to pharaonic times! Wives of pharaohs were used to cook this kind of sweet for priests who guarded tombs of their husbands (pharaohs). Kahk cakes were found in different tombs, they were of different shapes, with different filings and ornaments. Nowadays people start to cook Kahk one week before the end of Ramadan and bring cakes to their relatives by the end of the holly month. Kahk is made of flour, yeast and lots of butter. Actually not that difficult to do it yourself and so delicious to eat after! Where to buy: In Cairo during Ramadan all street ovens will sell this kind of sweet, closer to the end of the month as a rule. During the year big chains of sweet shops will offer Kahk as well, but not all the time you will be able to find it even there. Basbousa or its variety Harisa (famous in Alexandria mainly) is Egyptian semolina cake cooked with butter and yoghurt. If you want to cook it yourself a ready mixture is always available in most supermarkets, you just need to add butter and yoghurt, stir it well and bake in the often, then after it is a little bit cold put over sugar syrup. Where to buy: In Cairo there is a well known, one of the best mark called ”Kweider”. 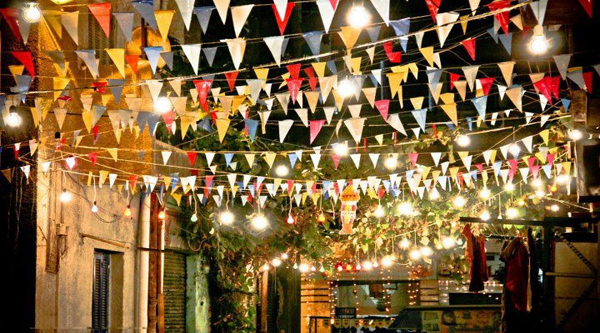 You can find the shops in Mohandeseen, Nasr city and Downtown. Over three generations of perfection... It all started a long time ago in Damascus, when the great grandfather Mohamed Selim Koueider created a unique kind of oriental sweets. A remarkable milestone took place in the history of the koueider's family when the great grandfather decided to move to Egypt, where he founded his first shop in Cairo in 1928. Since then the name Koueider became a synonym to the best sweets made by the best ingredients. Mohamed Selim Koueider's son Abdel Rahim Koueider carried on with his father's Profession, he continued the development of the art of fine pastries, and introduced new products. Today, the grandson Nasser Koueider is continuing the developing process, improving the quality , and always using the original unique recipe. Kind of sweet made from spun shredded wheat and filled with different fillings. In Egypt, as a rule, it is filled with cream or different nuts, and then covered with sugar and lemon syrup. As it is a traditional sweet it can always be found in oriental sweets-shops all over Egypt. There are several ways to prepare Kanafeh ( Kanafeh ) differ from the way you will find in a sweets-shop. People mainly cook this kind of sweet during Ramadan time. Locals do not use nuts or cream and prepare Kanafeh in so called “Ottoman way” when you break Kanafeh into small pieces and then fry it with butter until brown, add sugar syrup over and mix all together. It can be served with sour or sweet cream. Very delicious. Syrian people make Kanafeh with cheese! Very interesting taste. Where to buy: In Cairo in most sweet-shops almost all the year round, ex. Twinky sells really tasty Kanafeh with nuts or cream. The shops are located in Pyramids street, in the beginning, closer to Giza. So, on your way to the Pyramids, you can always ask your guide to stop at the shop to taste Oriental sweets. Should you wish to cook it yourself, many supermarkets sell half-ready frozen Kanafeh all the year round, but it will be not that delicious as the one, cooked in front of you by a local. In Sharm el Sheikh you definitely saw this sweet in your hotel restaurant but were afraid to taste! Now you know what it is all about and do not hesitate to try! If you do not find it in your hotel restaurant during dinner time, then sweets shops in the Old market will give you a chance to taste it. This kind of sweet is found everywhere, not just in big shops of sweets but mainly along the streets, you will find street salesmen offering this sweet. Egyptian Meshabek ( Jalebi ) made of flour and sugar syrup if baked properly can be very tasty. But since it is very popular, everyone does and sells it, so better to buy it from a shop you trust to enjoy the taste. I’d say it’s a kind of doughnuts, just looking like small balls and traditionally in sugar syrup. You can easily do it at home from flour, yeast and some other ingredients. Easily found in all big shops of sweets as well as small street-shops since it is a very popular kind of sweet in Egypt. It is a genius kind of dessert made from 3 ingredients! All that you need to do this very popular desert is milk, corn stretch and sugar! Fifteen minutes and your desert is actually ready, you need to keep it in the fridge until its cold and freeze and then enjoy. To make your life even easier you can buy ready mixture to do mahalabeya, it already contains vanillin, nice yellow colour for your desert and corn stretch, all that you need just to add some spoons of this mixture to cold mild, add sugar and boil it until ready. Usually ready desert is topped with some nuts or chocolate, actually you can top it with anything you like. This desert is easily found in dairy shops and often offered in restaurants after the main course. It is a very interesting Egyptian desert made of a special kind of very thin dough. It’s sold in most of big supermarkets so not a big problem to find the layers. To make Goulash you will need a filling usually nuts or custard (magalabeya), ready sugar syrup and some layers of the dough. You can make rolls from the dough or squares and then cut into pieces, the main idea is to put several layers between the filings. This popular desert is easily found all year round in all shops of sweets.